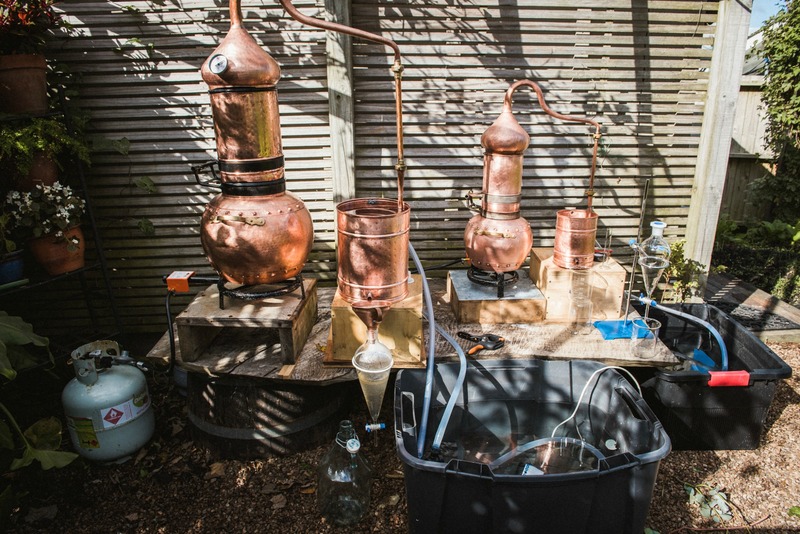 Distillation is an evolving practice that showcases a very special meeting between science and plants. At Alembics, we are committed to fostering a respectful and sustainable relationship with the natural environment and sharing our knowledge with you. Our how-to-pages are intended as guides, rather than gospel. 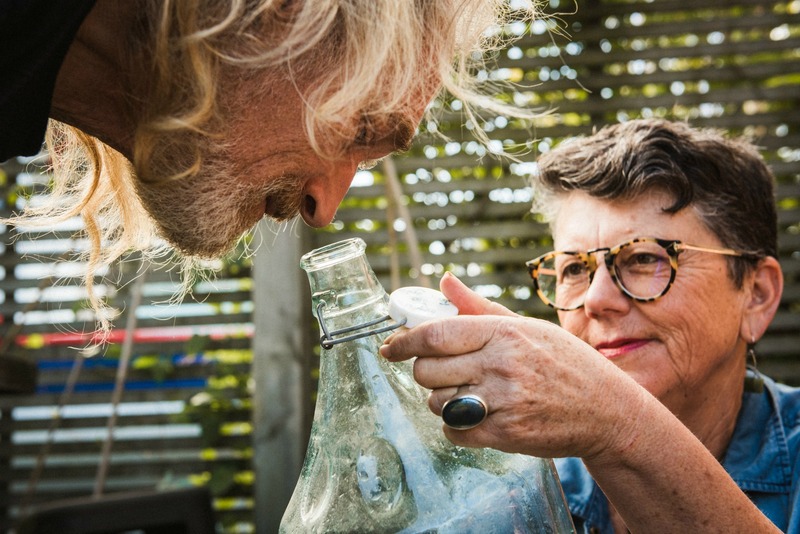 They have been developed as a fun and informative resource for craft and hobbyist distillers, and are not suitable for therapeutic or commercial practice. 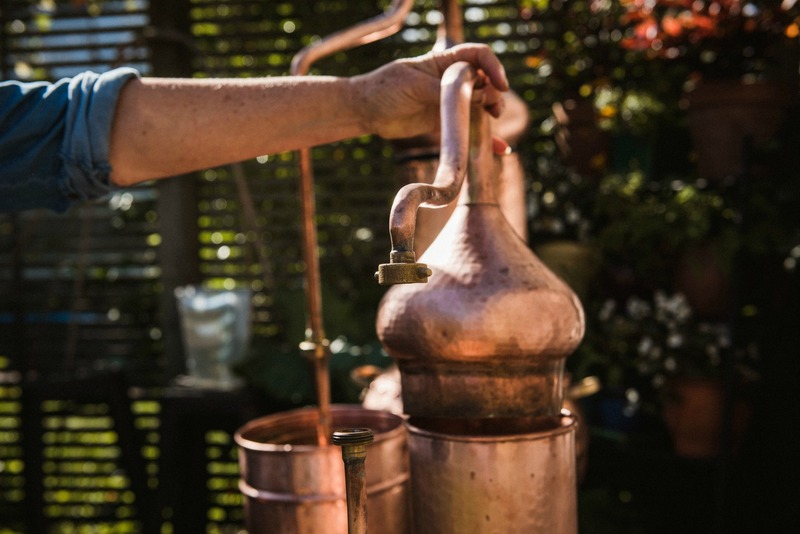 The essence of distillation comes from the latin word ’de-stillare’ meaning to drip or trickle down. Distillation is the separation of liquids by evaporation and condensation. The simplest way to visualise this is by thinking about the way steam settles into drops of water when it meets a cold surface. Distillation has been used throughout history to separate liquids from solids. 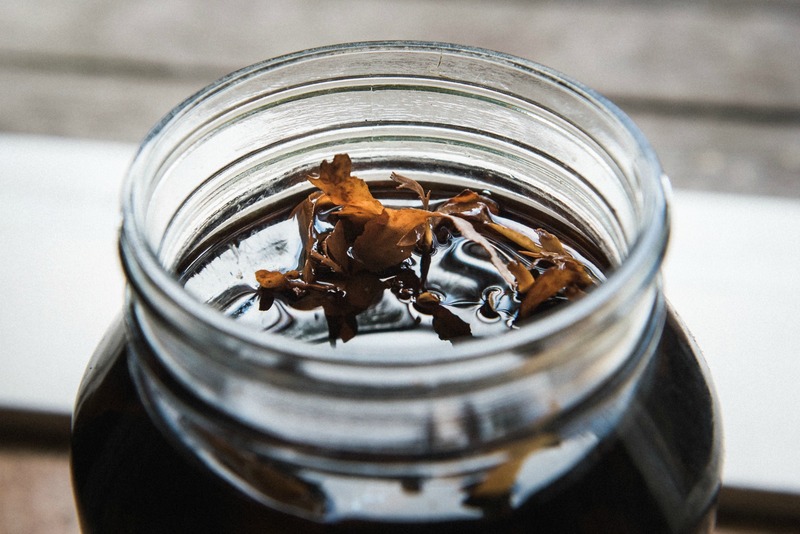 Consider the division of alcoholic liquors from fermented materials such as grapes and the separation of plants from water to create aromatic floral waters and essential oils. 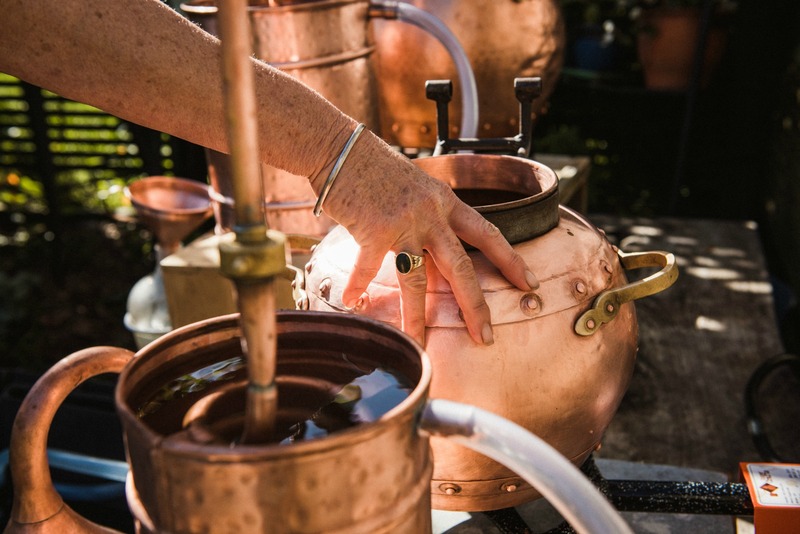 The first alembic still was invented around 200 AD by Egyptian and Arabic alchemists who used copper stills to create fine balms and perfumes and even attempted to convert base metals into gold! A typical distillation begins by heating water and botanicals in a pot still. As the temperature rises the most volatile constituents of the water/plant mix begin to evaporate. Vapours accumulate and find their way to the condensing recipient via a connecting tube or swan neck. In the case of a Traditional Alembic the swan neck leads to a serpentine coil in the condenser filled with circulating cold water. Once the vapours come into contact with the cold surface they condense to their liquid state and trickle down to be collected in a glass beaker drop by drop. The most vital and alive part of the plant or flower is now captured in a liquid form. This is referred to as the distillate. Copper has played a significant part in the history of mankind. Humans have been utilizing copper for thousands of years. Copper has twice the thermal conductivity of aluminum and nearly ten times that of stainless steel making it the ideal raw material for use with water and high heat. 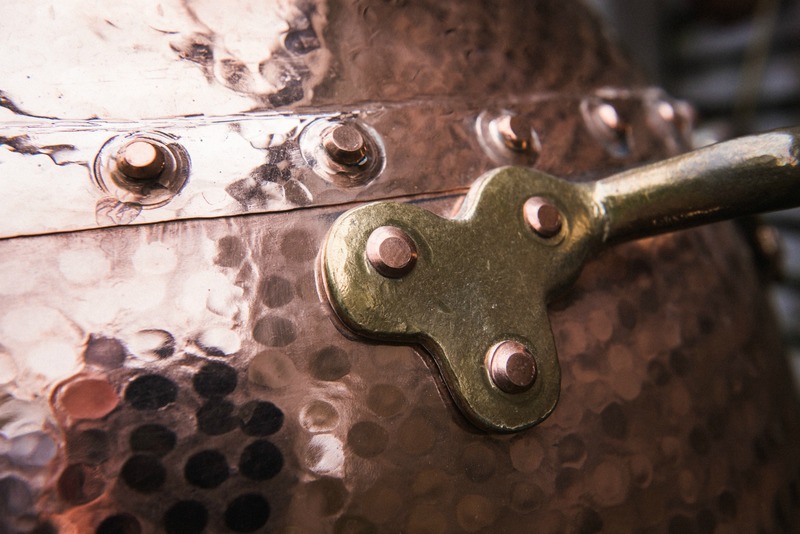 Scientific research suggests that copper is also highly antibacterial. Copper has antimicrobial properties that can inhibit waterborne microorganisms such as bacteria, viruses, algae—making it the material of choice for the removal of impurities and infectious parasites. 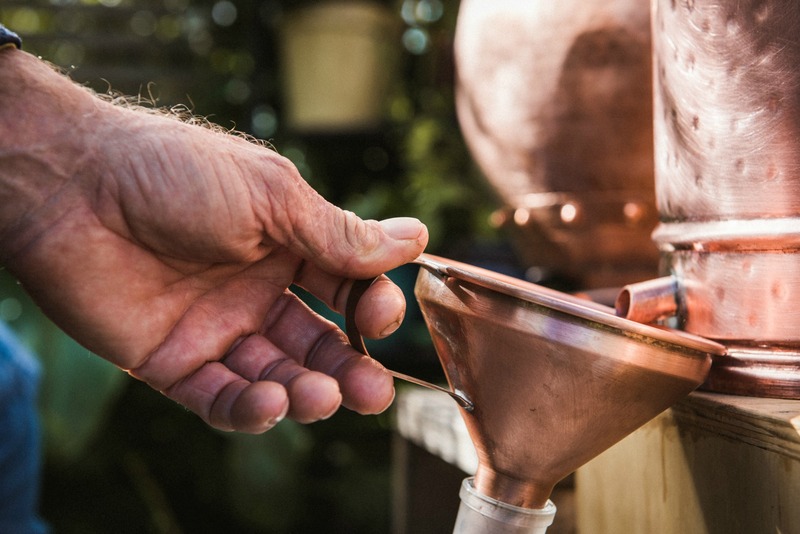 Distillations using copper stills create finer, more pure products. After you unpack your still it’s important to carry out a rye flour clean to avoid contamination of the distillate. 1. Check there is no obstruction in the birds beak and coil. 2. Pour the rye flour and water mixture into the pot of the still. 3. Assemble the still making sure you have cold running water flowing around the condenser. 4. Place the still on an electric ring or gas element, quickly bring to the boil and let it simmer for 5 minutes. 5. The rye/water mix will bubble up and pass through all parts of the still spurting out of the distillate outlet on the condenser. 7. Take the still off the heat, allow to cool and empty. Wash all parts thoroughly with hot water and allow to dry. 8. 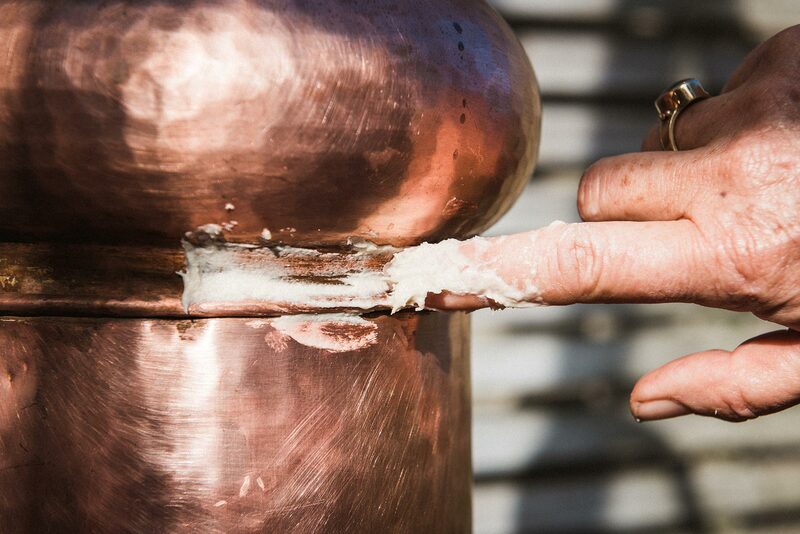 Check that no rye has congealed on the bottom of the pot, this must be removed before starting a distillation. 1. Assemble the still with hot water in the bowl. 3. Keep the condenser bucket empty of water. 4. Allow hot steam to move through the entire still until it’s coming out the distillate outlet. The steam will sterilize the internal parts of your still. 5. 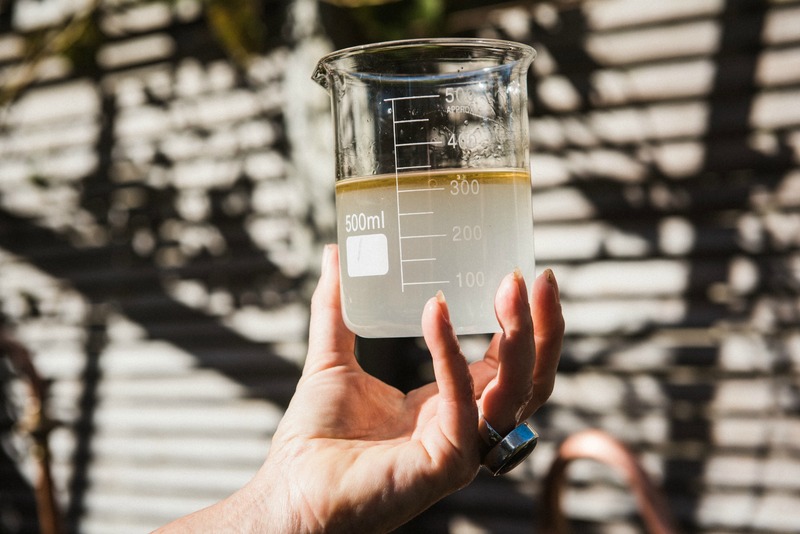 Fill the condenser bucket with cold water and distil water until it’s clear, tasteless and has a neutral pH. Now you are ready to start distillating! To obtain clean distillates of spirits hydrosols and essential oils it’s important to thoroughly clean your still between distillations. 1. Dissolve 1 cup of citric acid in a 10 L bucket of warm water. 2. Immerse the parts of the still in the citric acid solution until you see the raw copper starting to appear. This should happen quickly but on severely tarnished copper it may take some soaking. 3. Using a nylon pot scourer thoroughly clean the inside and outside of the still until all the tarnish is removed. 4. To clean the coil, block the distillate outlet, pour high proof alcohol (90%) into the condenser coil. Let it sit for several hours, unblock the distillate outlet and let the alcohol flow out. 5. Rinse all parts of your still thoroughly with warm water and dry with a soft cotton cloth. Fill the condenser bucket with cold water and distil water until its clear, tasteless and has a neutral pH. Hydrosol is an aromatic botanical water. Think of it as the cellular water of plants. When hot water is poured over plants the heat of the water softens the cells releasing the plants volatile organic compounds into the water. 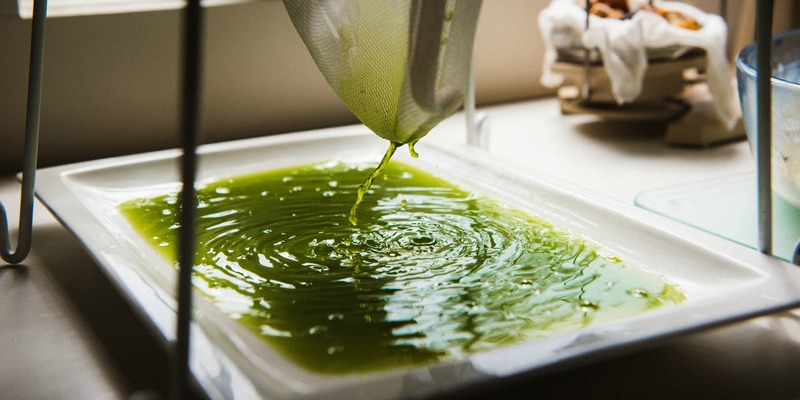 The water soluble parts and tiny molecules of essential oil are caught in the vapours and travel through the still to the cooling condenser where they are converted into a liquid form. The end result is a richly aromatic and intensely hydrating botanical water which can be sprayed all over the face and body. Botanical hydrosols are uplifting and mood shifting, ideal for many therapeutic and cosmetic purposes because the tiny aromatic molecules are easily absorbed through the skin and can travel throughout the body. But hydrosol is not just restricted to use in personal cosmetics or natural therapies. Hydrosol can also be used across a range of innovative, new platforms. 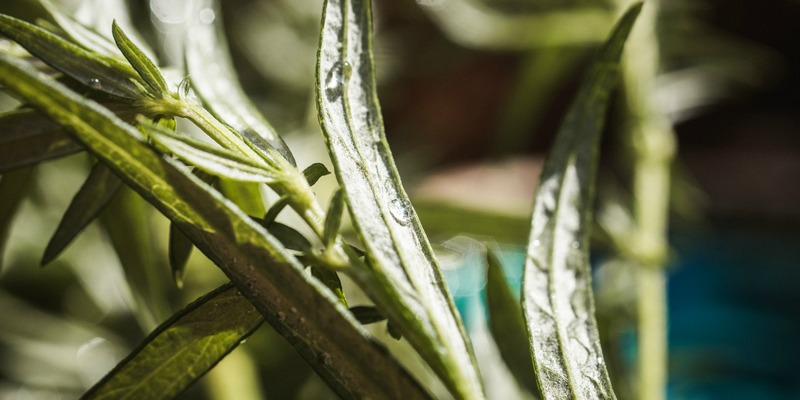 For example, Rosemary, Bay or Rosehip hydrosol can be used in gastronomy to add subtle and complex flavours. Hydrosol is also being used as a base for cocktails and non alcoholic beverages. 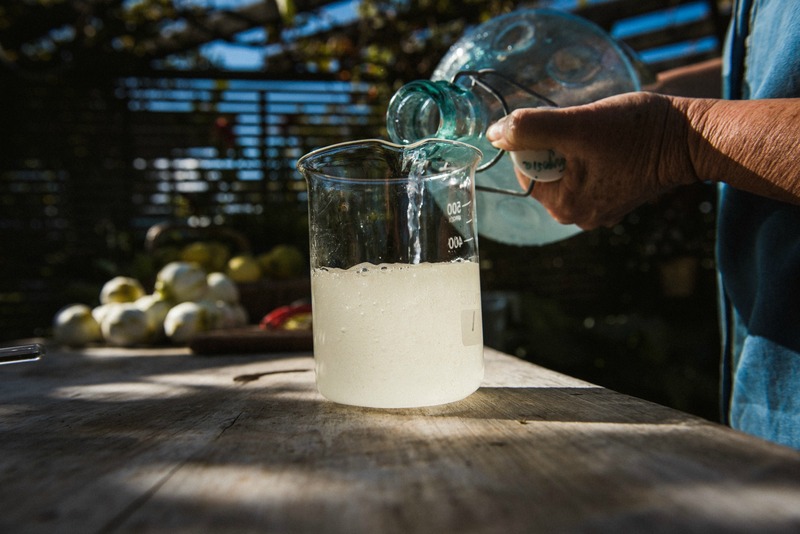 The Traditional Alembic is the still of choice for making hydrosol. Use the table below as a guide to help plan your water to botanical ratios and then follow the step by step instructions. Try to use plants that are in season and offer abundant supply. 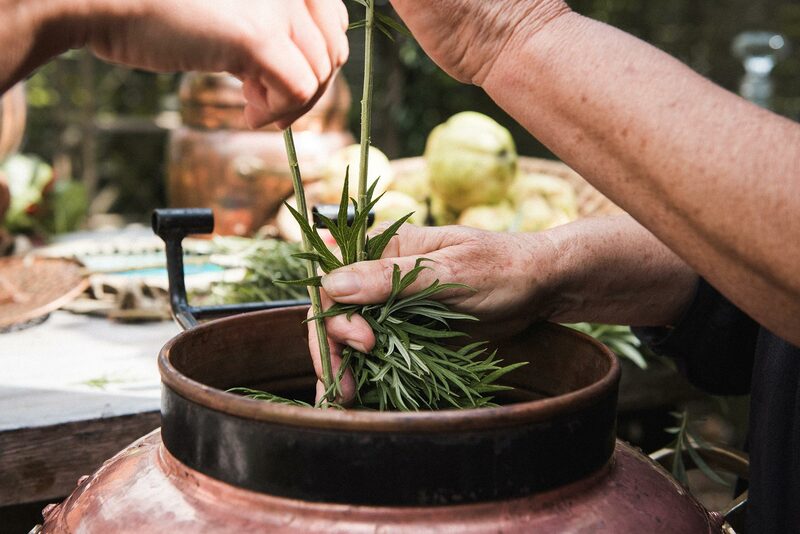 Rosemary and lavender are good to start with, or you could experiment with aromatic New Zealand natives like Tarata or Kawakawa. 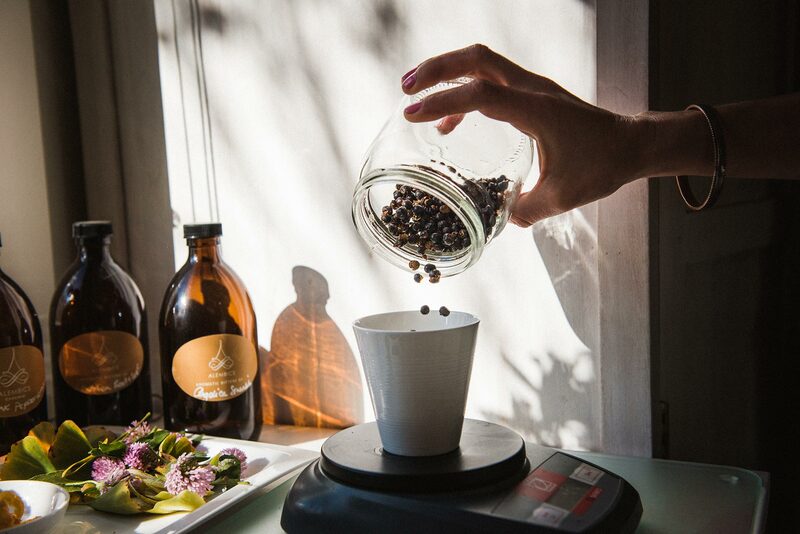 For best results harvest botanicals early in the morning when they are fresh and dewy. Lemon Verbena or Lemon Balm are good plants to start with. 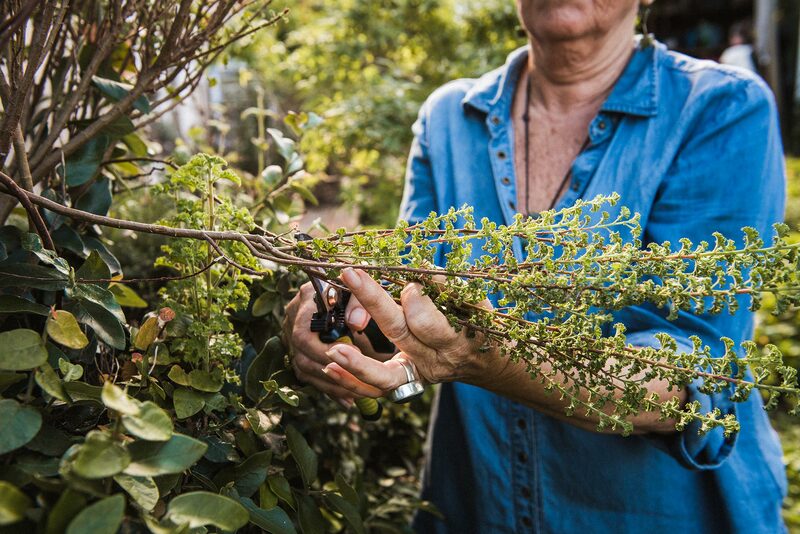 Prepare botanicals by stripping leaves off stems and removing insects. Set aside. Press your plant material into the pot and cover with the measured water. Make sure your plant material is submerged in the water and is as wet as a sponge. Place the minaret dome on top of the pot. Connect to the condenser bucket. 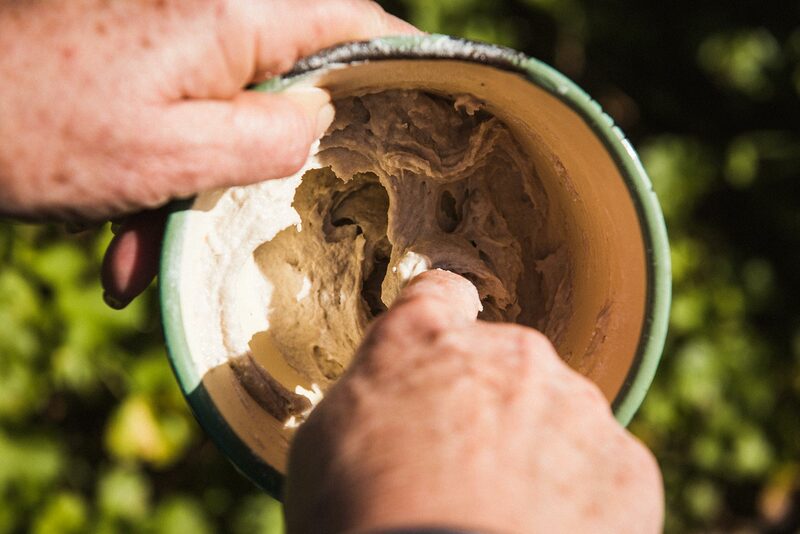 Seal the join between the pot and the dome with rye flour paste or fire retardant electrical tape. Set up your recirculating pump so that water flows continuously around the coil. Simmer the water and don’t forget to have a sterile glass beaker under the distillate output pipe to catch your hydrosol! Essential oils are the vital and pure aroma of plants and flowers. This precious aromatic can be gently captured and transformed into a liquid oil through the process of steam and hydro-distillation. 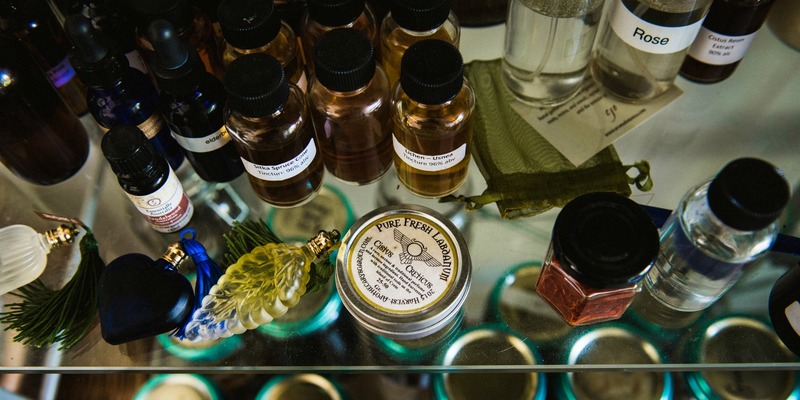 Essential oils have been used throughout history in cosmetics, perfumery, massage and ritual. Plants, flowers, barks and resins all emit fragrance because they contain volatile organic compounds (VOC’s). Think of your favourite sweet smelling flowers. Rose, orange blossom and jasmine, plants have perfume because they contain essential oils, the true magic of the plant world. 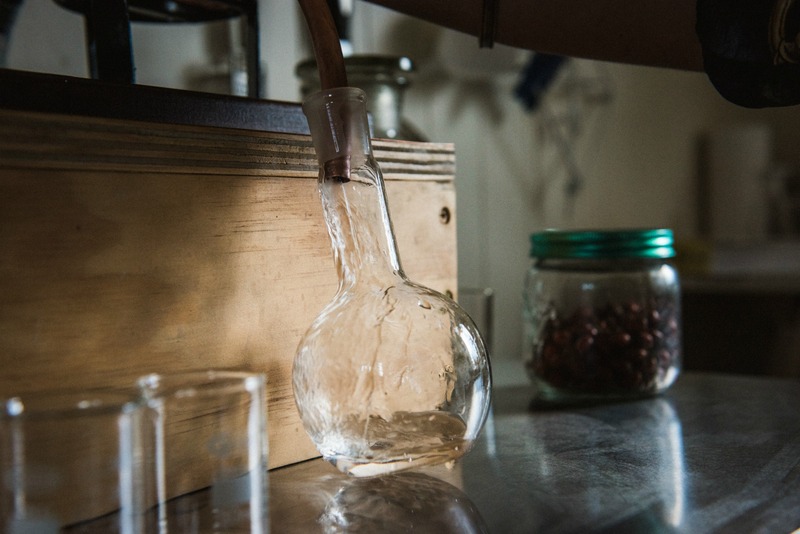 The Alembic Column still is the best choice for the steam distillation of essential oils. Use the table below as a guide to help plan your water to botanical ratios and then follow the steps by step instructions. Harvest botanicals when dry rather than wet and dewy. Prepare botanicals by stripping leaves off stems and removing insects and damaged parts. Set plant matter aside. 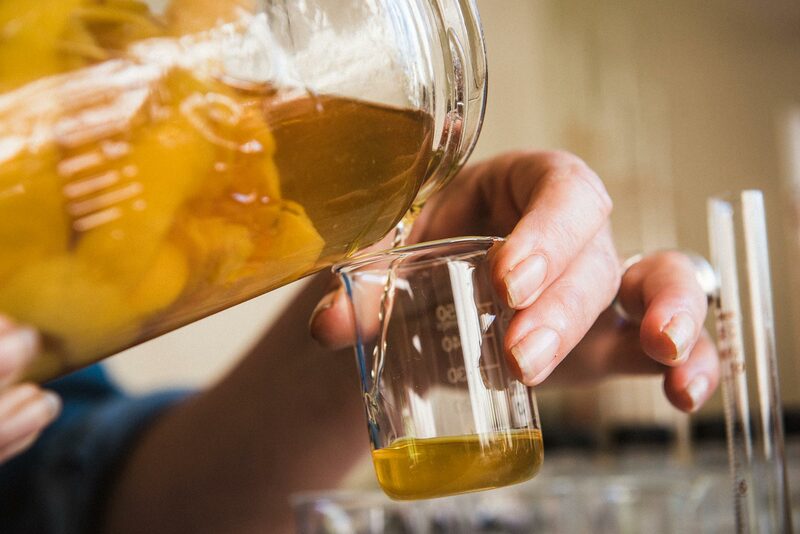 Pack botanicals firmly and evenly into the column, making sure there are no gaps. Fill the pot with water to the rivet line. Place the column on top of the pot. Push the minaret dome down on the top of the column so that it fits firmly. Attach the extender pipe to the swan neck and connect to condenser bucket. Set up you recirculating pump so that water flows continuously around the coil. The idea here is to create steam! Don’t forget to place a sterile glass beaker under the output pipe to catch the liquid distillate. 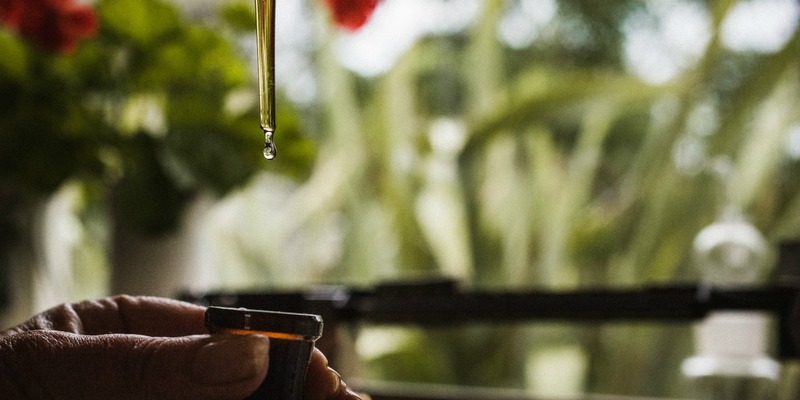 Pour your liquid distillate into an essential oil separator and let the liquids settle until the oil rises to the top. Place a beaker at the bottom of the oil seperator. Turn the tap to release distillate. When all the water is removed, only essential oil will be left. Transfer the essential oil to a cylinder and put in the freezer. The water molecules will freeze leaving the essential oil in a liquid state. After 10 minutes, pour the essential oil into a light proof bottle. * Your expected yields of essential oil will vary from plant to plant, season to season and place to place. Keep a good record of your distillations so that over time you come to understand each plant and their yields and potential. Spirits are alcoholic beverages made from fermented fruits, grains or vegetables. Spirituous beverages derived from fruits are known as brandies, fruit wines, schnapps or eau de vie. 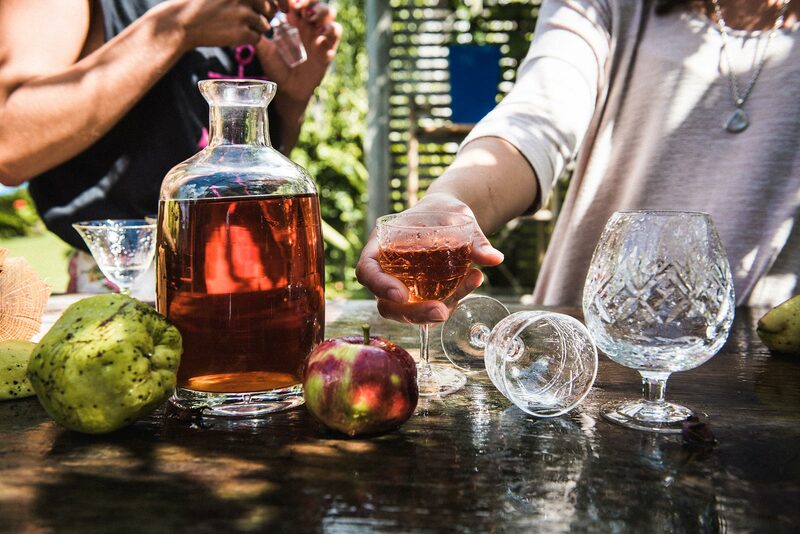 The process for preparing fruit wine or brandy begins by preparing a mash of ripe fruit to which yeast is added. The yeast feeds on the sugars in the fruit and produces alcohol as a by product. This is then distilled to concentrate alcohol and purify flavour. Whiskey and vodka are also spirits but they are derived mainly from distilled fermented grains. To make whisky or vodka, grains are soaked in water to encourage the conversion of starches to sugar. This mixture or ‘wash’ is then drained and the liquid retained for fermentation. During fermentation yeast converts the sugars in the wash to alcohol. This is then distilled to concentrate alcohol and purify flavour. 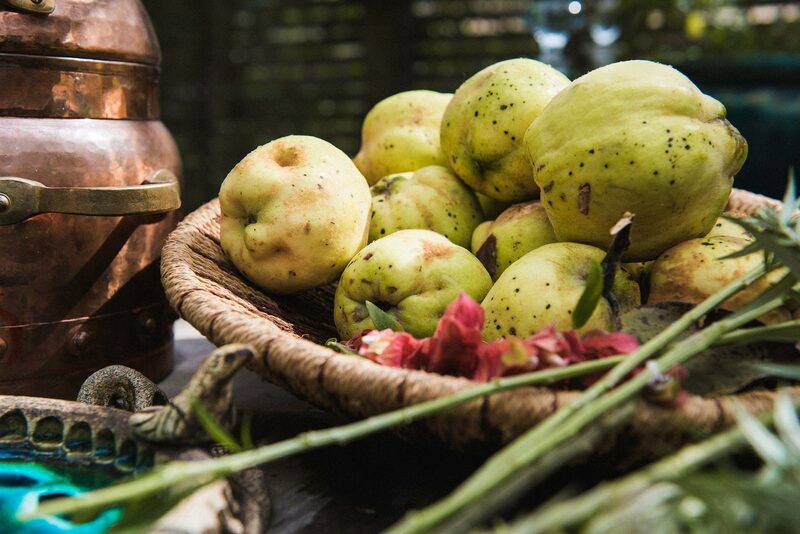 Here we take you through two techniques for distilling fruit derived spirits. 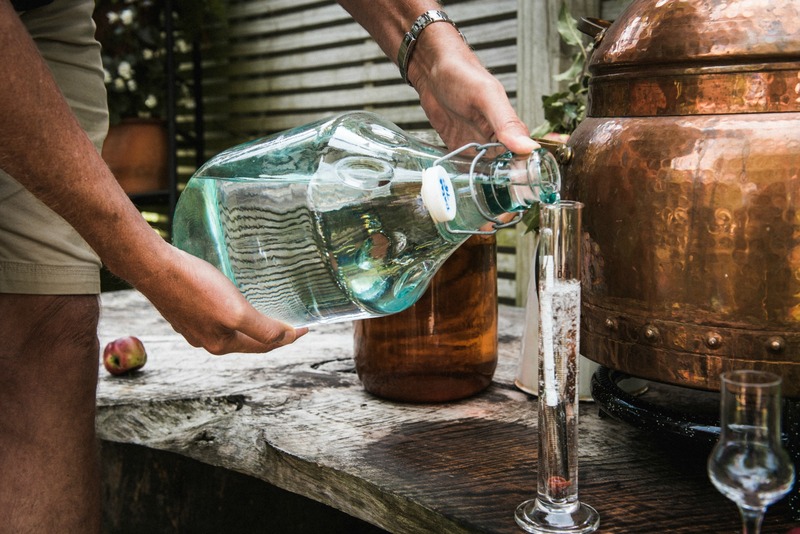 The Alquitar is the best choice of still for making fruit brandies. The quantities used in this guide are based on using a 10L Alquitar. A classic example of a great fruit brandy is Calvados. 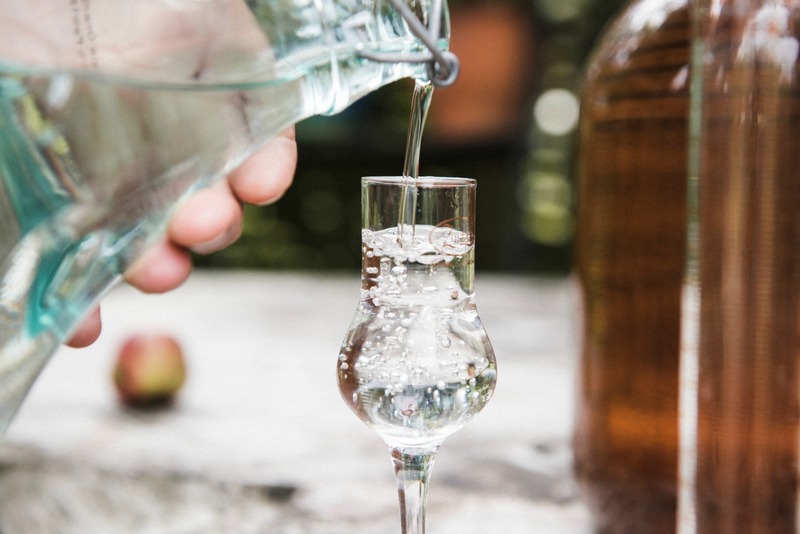 However, it’s important to remember that fruit brandies are made by most cultures throughout the world and tend to utilize whatever fruit is fresh and in abundant supply. In this guide we are using plums. 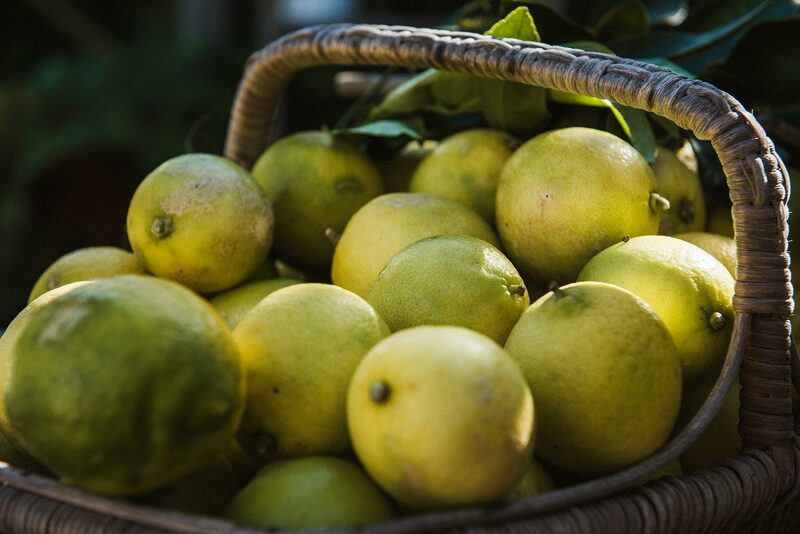 Pick fruit in the late afternoon when it has been warmed by the sun. The flavours will be most pronounced and the fruit will ferment faster. Make sure you only pick the best ripe fruit and discard damaged specimens. Pick a total of 25 kg plums enough to fill a 20 litre brew bucket. Carefully wash the fruit in plenty of cold water then place in crate and lay in the sun to dry. Tip the plums into a sterile bucket and mash the fruit by squeezing it with your hands until it converts to a fine pulp. A paint stirrer is useful. Half fill an airlock ferment container with thoroughly mashed fruit. A glass balloon jug or a brew bucket with a firm fitting lid would be fine as long as it is airtight. Check the pH level of your mash to ensure a successful fermentation. The ideal fermentation level is 4 but slight variances can be tolerated. The pH levels can be corrected with lemon or orange juice. Add water to the mash in the ferment container to give it a liquid consistency. The water should be 15% of total volume. Before mixing in the remaining half of the fruit mash, begin to add the yeast and nutrient salt. Fit the airlock and top up the container with water to the required level. This will allow the carbon dioxide to escape and keep the air and foreign matter out. Let the mash ferment. During the entire fermentation process the mash should remain at a temperature of between 20°C to 25°C. Fermentation should be carefully monitored. This is where practice and experience comes in. Depending on sugar content, temperature and yeast, fermentation will take anything from 5 days to 2 weeks at which time the airlock stops bubbling. After allowing the mash to settle for a day decant or siphon off your mash into the still and discard any sediment at the bottom (the leys). In a 10L Alquitar distill 8 liters of mash at a time. Set up your gas element on a stable surface. Place Alquitar on the element. If you are using a recirculating pump, place a large (150 L) water container next to the still. Attach the hoses to the inlet and outlet areas on the hat of the Alquitar. Fill the condenser with cold running water. It’s important to have cold water flowing through the condenser throughout the entire distillation process to keep the hat cool. Quickly bring the mash up to temperature (75 C). Check the temperature of the copper tubing near the brass fastener regularly and once you find that you can no longer hold the copper tubing lower your heat source to a slow simmer. The slower the distillate exits from the condenser spout the better. Discard the first 2% of distillate (per 1L in the pot) as this contains undesirable volatiles. For 8 litres of mash in the pot, discard the first 200/250 ml of distillate. Approximately 20% of volume in the pot are the sweet alcohols that you are looking to collect. So 8 litres in the pot, should equate to 2 litres of hearts. The ‘Tails’ are the last stage of distillation and need to be taken out as well. At the end of the ‘Hearts’ and at the beginning of the ‘Tails’ expect a hydrometer reading of 30% alcohol. You will also note a change in taste, similar to dishwater. The solution may also appear slightly milky. 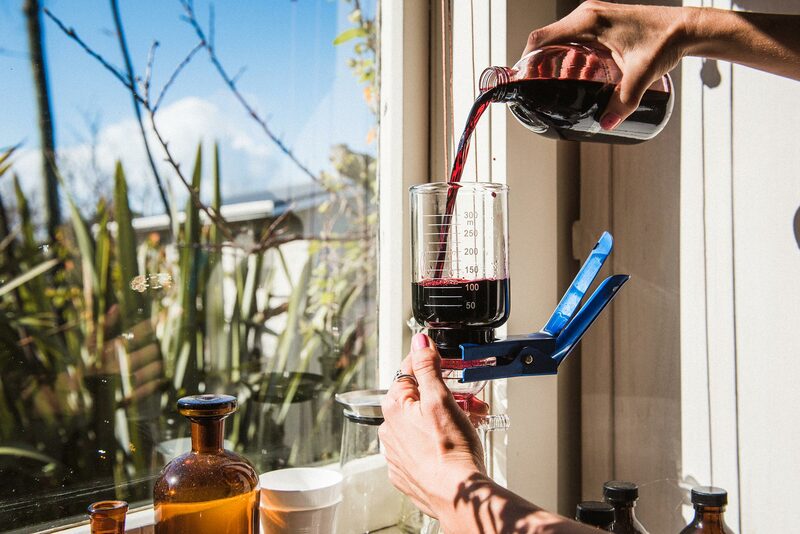 Check the spirit at regular intervals by placing your spirit hydrometer into a 100ml glass measuring cylinder and filling the cylinder with spirit until the hydrometer floats. On a long distillation, take 50 ml samples and check the alcohol level. Always remembering to taste, smell and see. 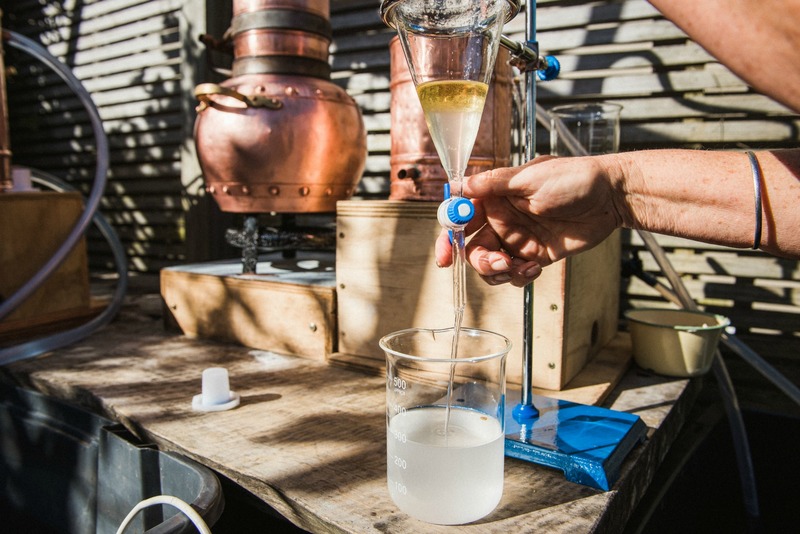 You can use all still styles to successfully make eau die vie. The following instructions are based on using a 2.5L Appliance still or a 2.5L Alquitar. If you are using a larger still it’s just a matter of scaling the proportions up. Make sure your still is clean and the tubes free of any blockages. Set your still up in a well-ventilated place and on an even safe surface. Assemble your recirculating pump so water is flowing around the condenser. Check your heating and cooling systems are all operational before you begin. Fill the bowl of your still with wine. Do not exceed more than 80% capacity. Heat the wine to a simmer but do not boil (75—80 degrees Celsius). Catch the distillate in a large glass beaker. 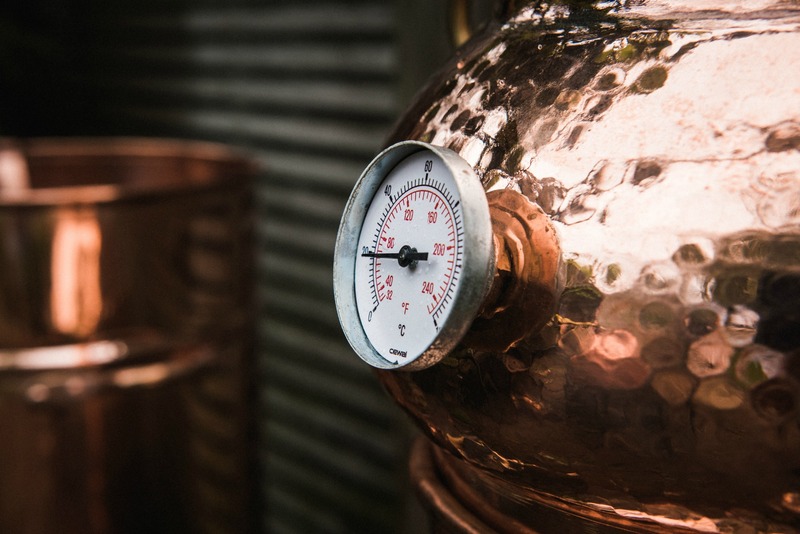 The first 2% volume of your distillation is known as the ‘Heads’. These need to be discarded as they contain methanol and other harmful alcohols. For 1.5 litres of wine in the pot discard the first 20-30ml. Check by acrid smell and taste. Keep the heat at a simmer and collect the ‘Hearts’, approximately the next 20% of volume in the pot. For example, 5 L of wine in the pot will equate to 1 L of spirit hearts. This is the good stuff! And although colourless the spirit will have a subtle grape flavour. For more detailed instruction we suggest you attend an Alembics workshop. 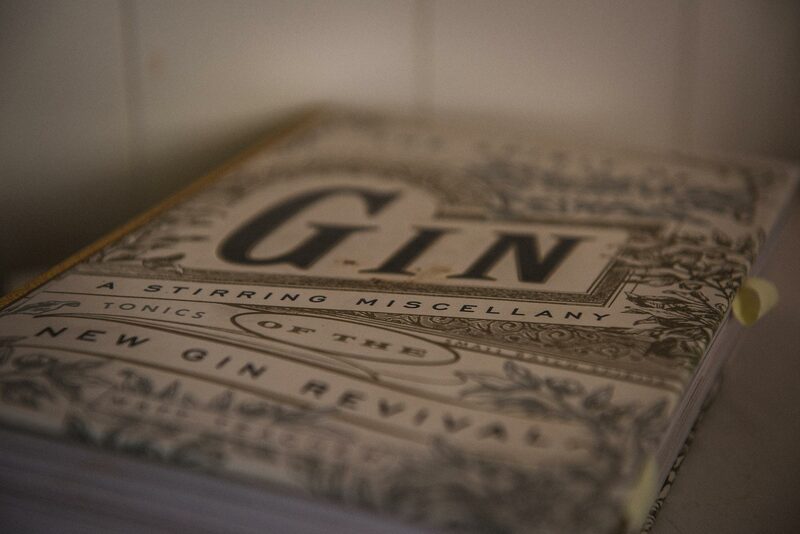 Good botanical gin is delicious, delightfully aromatic, clean and uplifting! 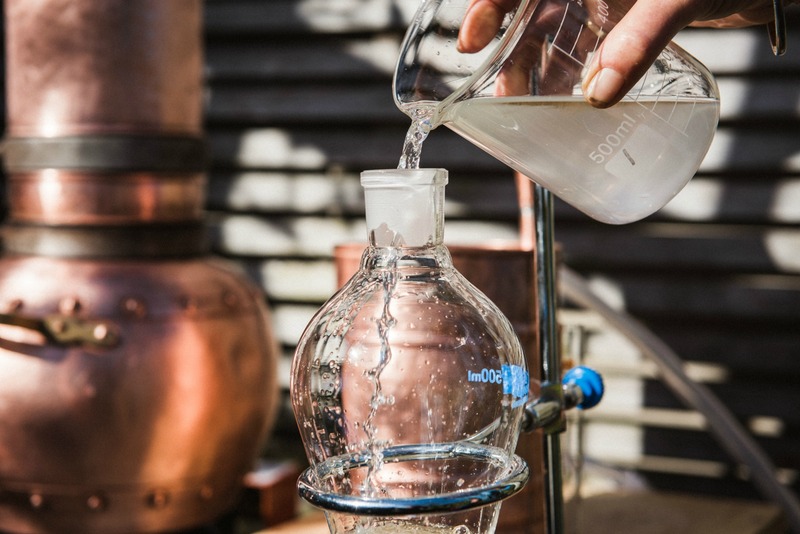 Technically speaking, however, gin is the result of a vapour distillation and the (sometimes) maceration of aromatic botanicals and a neutral spirit. 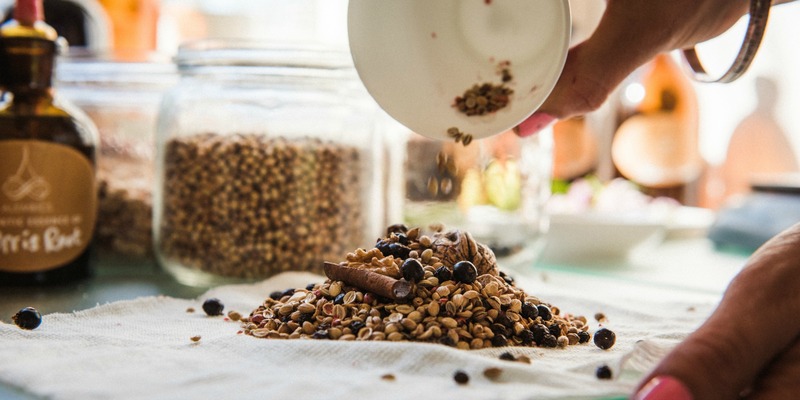 Artisan botanical blended gins are currently experiencing a huge surge in popularity and interest, perhaps due to the perception that they contain the healthy, invigorating properties of fresh botanicals. Remember that the quality of your gin will reflect the quality of your botanicals and aromatics. If they have been sitting on a shelf for months they will have lost much of there “zest”. 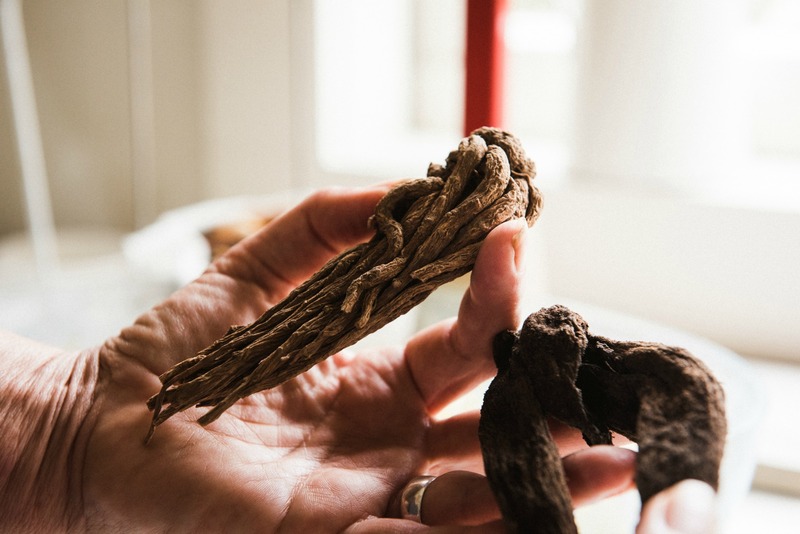 Some botanicals are difficult to source, so check out our specialised selection of quality aromatics if you need help. 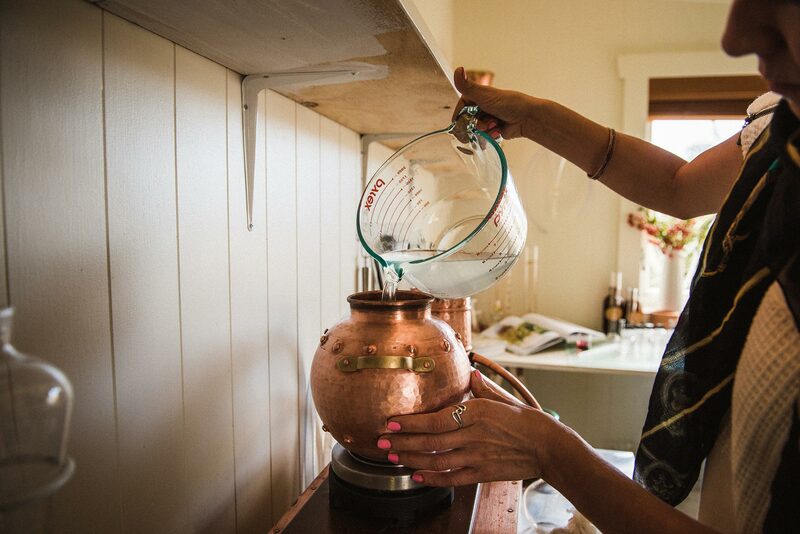 A 2.5 L Appliance still or a 2.5L Alquitar is the best choice for novice gin makers looking to play and experiment. Compile your ingredients and equipment and follow the step by step instructions. 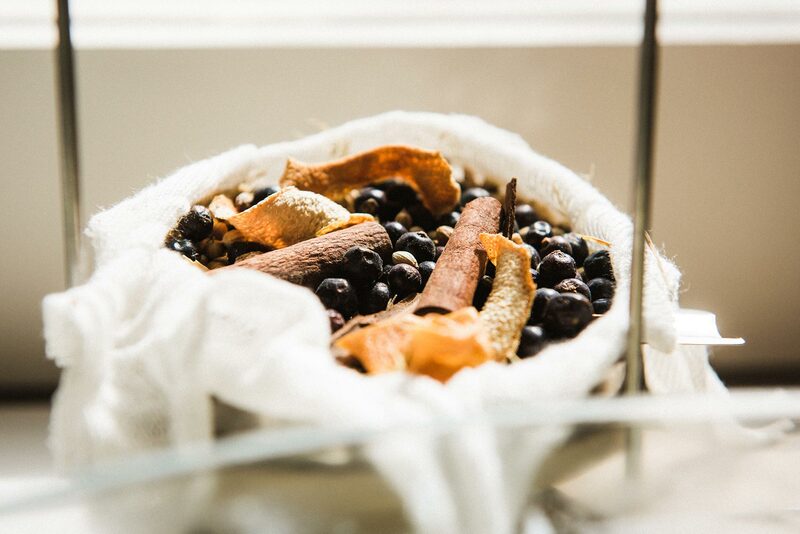 Place the selection of aromatics in a muslin or loosely woven cotton fabric square. Gather up and tie with cotton string. Or, alternatively, purchase a classic gin pouch from our aromatic library. Assemble your still checking that it is clean and that there are no blockages in the tube or condenser coil. Set up your water cooling system so that cold water is flowing around the condenser throughout the distillation. Pour 2L of 40% grain spirit or vodka into the pot. 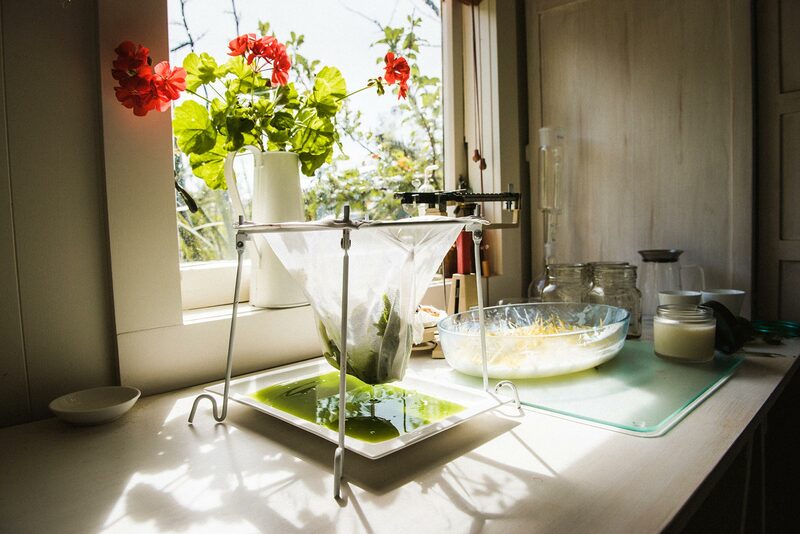 Place your muslin bag of botanicals in the column or on the basket of the Alquitar. Let the botanicals and water simmer at around 75-80 degrees. When the copper pot is hot to the touch and starts to vibrate turn it down to 4 or medium. Vapours will be released and will move upwards and through the botanicals. If you have put 2 Litres of alcohol in the pot you can expect approximately 1 litre return. When you have collected 1 litre of spirit, pour some into a 100ml flask and drop the hydrometer into the flask to measure the alcohol percentage. It should be around 80%. Using the abv calculator on www.homedistiller.org add a litre of distilled water to make 2 litres of gin at 40% proof. Bottle and label the gin clearly with details of the blend you have chosen, alcohol abv and date of distillation. Feeling confused? Want a little assistance to get started? 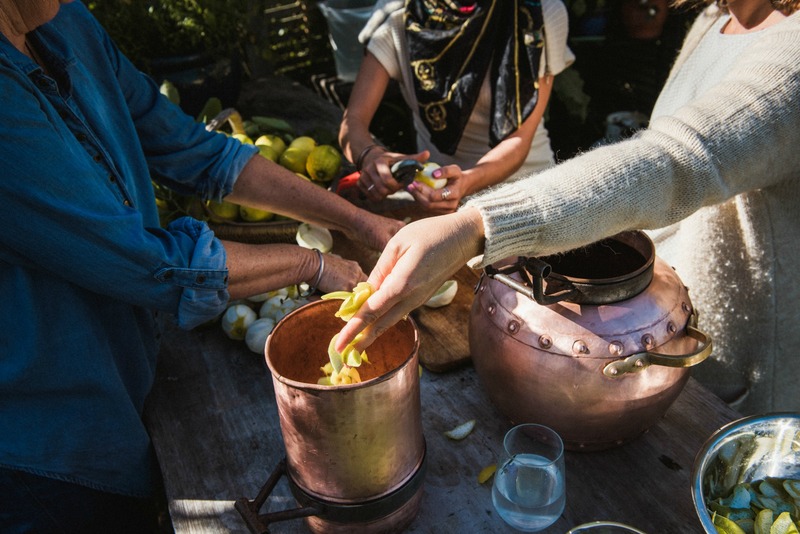 Come to one of our Gin Immersion Workshops. Over the years we have tried many recipes for liqueurs, aperitifs and cocktails. Here are some you may like to try. Making an orange liqueur is not difficult and can be great fun especially if you’re entertaining friends at home and wish to serve artisan liqueur after a delicious dinner. Orange liqueur is also great in deserts and savoury poultry dishes, or added to pre-dinner cocktails and spritzes. Although the still used in this guide is an appliance still you may use any type of still for this distillation process. Remember, you can modify this recipe in any way you like by trying other citrus fruits, or by adding a few cloves or honey. Ignite your imagination but remember to use spices sparingly. 1. Thinly slice 6 whole oranges and lay evenly on the bottom of a pie dish. Sprinkle with 1 tbsp of brown sugar. 2. Pour 500ml of eau de vie over the orange slices and sprinkle with another tbsp of brown sugar and allow to stand overnight so the flavours marry. 3. 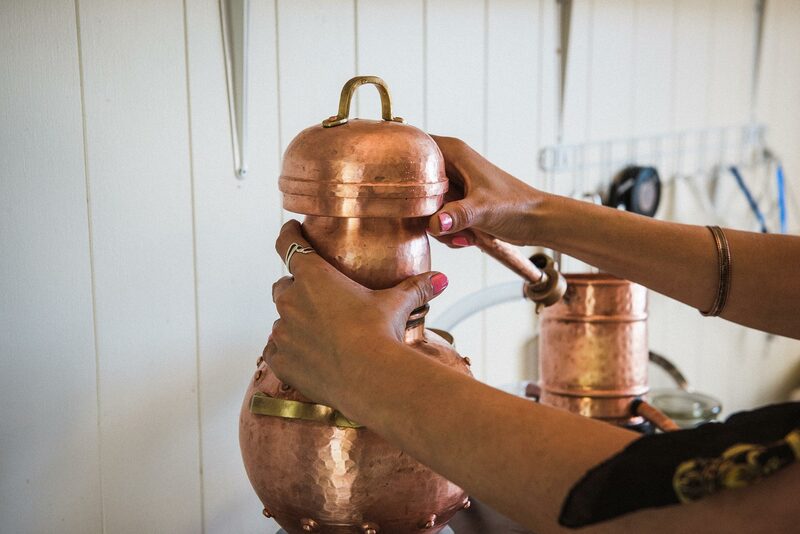 The next day, using a 2,5 L Appliance Still or a 2.5 L Alquitar, pour all the liquid from your mixture into the copper pot. 4. Place your orange slices on the sieve plate. This will allow the rising vapours to mingle with the orange slices thereby enhancing the flavour even further. 5. Assemble the still by attaching it to the condenser bucket. Have your recirculation pump set up so cold water is flowing around the condenser throughout the distillation. 6. Adjust the temperature control of the hotplate to its highest position initially. Check the temperature of the copper tubing near the brass fastener regularly and once you find that you can no longer hold the copper tubing it’s a sure sign the hot vapours have begun the distilling run. 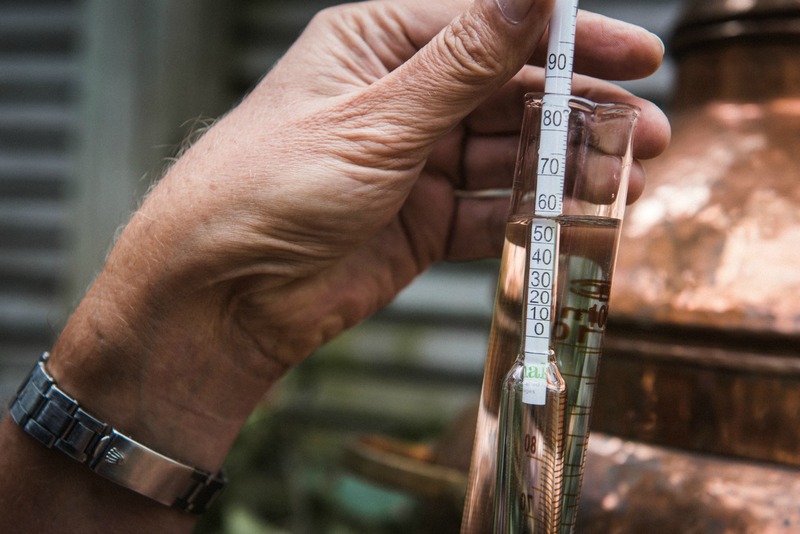 Lower the temperature control to 4 and maintain a slow and steady distillation. 7. Check the taste when you have collected 300ml and continue to keep taste checking. When the taste is bland with no flavour or spirit, turn off the still. Remember Dubonnet on ice? Although a little old fashioned, the taste, colour and aroma of a good Dubonnet is still exotic and enticing and bound to make a comeback. Quince Dubonnet is our version. It has the same low abv (15%), is a deep rich red, has lovely fruit driven flavour, is great with ice and soda and of course as a traditional Gin & Dubonnet. Truly, a queenly drink. 1. Peel and core 6 ripe Quinces, chop roughly and place in a shallow over tray. 2. Drizzle 2 tbsp of maple syrup or honey over the top and sprinkle with 300ml of Rose or a white wine. 3. Place in a moderate oven and cook for 3-4 hours, until they are deep red and the juices are starting to caramelize. 4. Place all the contents on the tray in a clean mason jar. 5. Cover with eau de vie and label with the date. 6. Forget about them for 3 months. 7. Three months later, strain the liquid into a clean jar. 8. Allow to settle for 2 days so the remaining solids precipitate and settle on the bottom. 9. Strain again through into another clean jar. 10. Filter through a fine jelly bag or ideally a coffee filter. 11. Add more sugar syrup or agave syrup to taste. Mix all together and leave for several days or more in a sealed glass jar. Check for taste and aroma and then strain through a double coffee filter.